What if you can only automate your tests in one browser using Selenium, i.e. Firefox but your web application supports Chrome and IE as well? This implies that testing is required on all three browsers! If this is the case, then Selenium is as useful as sticking your head in sand. Oh, don’t panic! Our ruling champ, WebDriver is here for our rescue. And this is our topic for the day. Let’s dive in! Step 1: First things first! Let us download the required executable files. Go to ‘www.seleniumhq.org/download’. InternetExplorerDriver is available under ‘Internet Explorer Driver Server’ section. 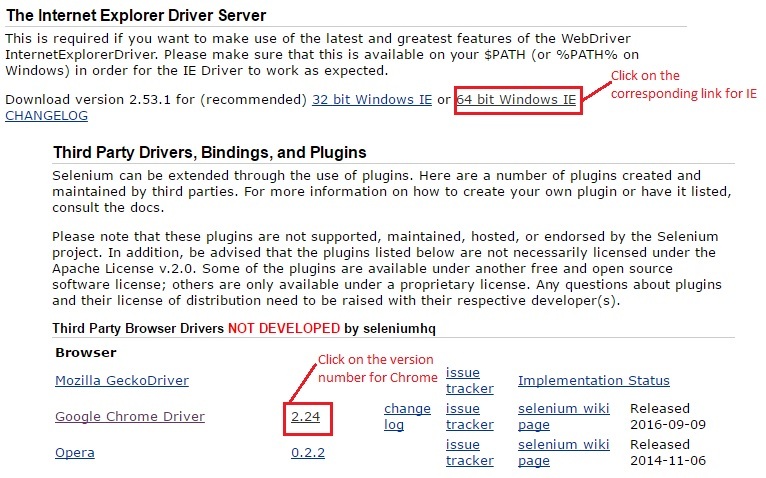 ChromeDriver, Opera, SafariDriver are available under ‘Third Party Browser Drivers’ section. In this post we will only discuss InternetExplorerDriver and ChromeDriver. Similar procedure is to be followed for other browsers set up as well. Step 2: Once the executable files are downloaded, extract and save them in desired path. I have created a folder (right click on the package -> New -> Folder) named “browser-drivers” within the project in eclipse IDE and copied the downloaded files for easy access. Step 3: Now, let us create two new classes by “right clicking on the package -> New -> Class” and naming them as ‘HelloWorld_IE.java’ and ‘HelloWorld_Chrome.java’ respectively. Open IE/Chrome browser as per the test case. Display ‘Hello World’ message in the console. If noticed, this code looks very similar to what we saw in our previous post, “First test script – By launching Firefox”. These other browsers require a system property set up as its direct launch is not supported. It is required that the path to the driver executable, “IEDriverServer.exe” must be set by the “webdriver.ie.driver” system property. Specify the path where the executable is saved in your system accordingly. Once this statement is typed, a squiggly line appears below ‘WebDriver’ and ‘InternetExplorerDriver()’. Upon hovering, the eclipse will suggest all possible quick fixes. Click on the first fix that suggests importing respective packages. The following code looks quite self-explanatory from the comments provided. It just navigates to the google page once IE browser is launched, prints ‘Hello World’ message to the console and closes the browser window. There are only two noticable changes if this code is compare to ‘HelloWorld_IE.java’. We can thus conclude that by specifying the respective system property and providing exact driver class instantiation, respective browsers can be launched and automated easily with the help of WebDriver. Slowly and finally WebDriver is getting its time in the Sun I guess! You are all welcome to raise your voice in the comments section in case you face any issues in launching various browsers. Until then, see you again in another post! Have a nice day!